Situated on the edge of working farmland the accommodation is one of two detached barn conversions which have been designed with great care and style to make the most of the views. Guests are welcome to set out on foot from the property and head for the main farm where various activities are available including watching the robotic milking or meeting the cows and sheep. Walk a little further and you will reach the picturesque West Dorset village of Whitchurch Canonicorum in the lovely Marshwood Vale with its River Char winding down to Lyme Bay at Charmouth. Lyme Regis with its historic Cobb and harbour is nearby as is the bustling market town of Bridport which boasts many pubs shops and restaurants. Just a mile south of Bridport is the charming fishing village of West Bay. Attractions include Jurassic Fun Centre Lyme Regis Marine Aquarium and Axe Valley Wildlife Park. Stepping inside the accommodation is open plan light and airy with exposed beams and original barn windows. In the modern kitchen area you will find an electric oven and hob microwave fridge/freezer dishwasher and washing machine. Enjoy sociable meals at the dining table nearby before settling down in front of the wood burner for a cosy evening watching the TV or a DVD. A step up leads to the ground floor bathroom and also one double bedroom which has a door opening onto the garden. Heading upstairs on the first floor there are two more bedrooms. 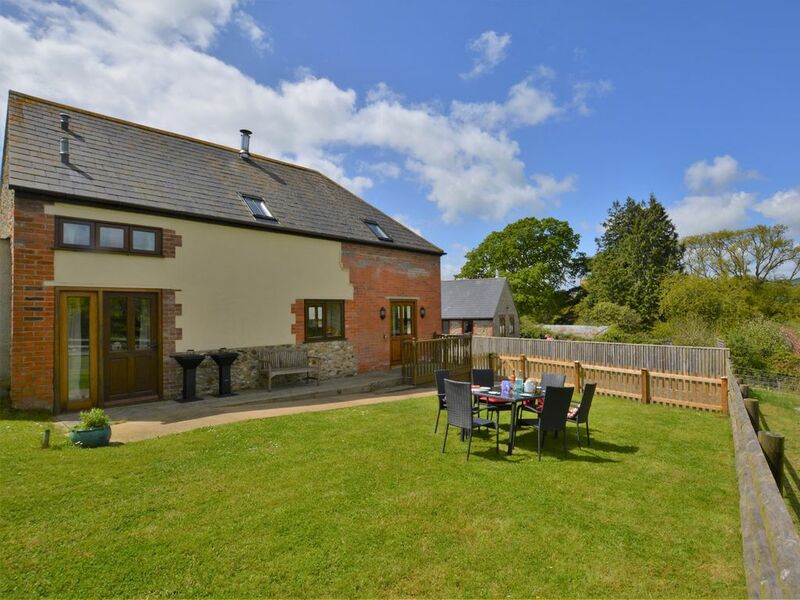 Firstly a double bedroom with exposed beams a skylight and en-suite shower room together with an impressive triple room with an en-suite bathroom ideal for children. Moving outside there is an enclosed garden overlooking the farmland where you may be able to watch some of the farm animals going about their daily business. Relax on the sunny decked area where there is garden furniture and also a BBQ perfect for those summer days. The lawn garden beyond offers a safe space for children and dogs to play. Off-road parking is available outside the property.